Medicaid Helps Washington, D.C., Clinic Care For Ex-Prisoners : Shots - Health News After they are released, former prisoners often don't have jobs or health insurance. The federal health law's Medicaid expansion could change that soon, though. Some states and the District of Columbia are getting a head start. 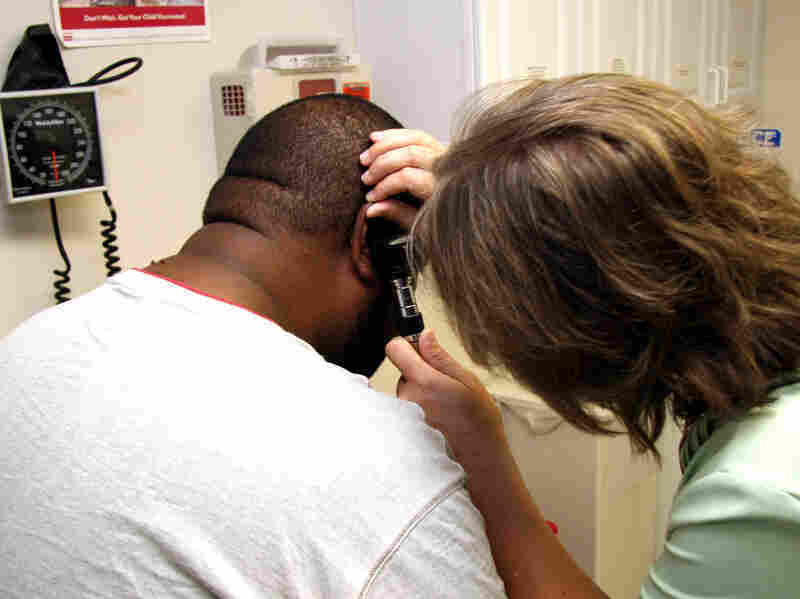 A Unity Health Care patient gets his ears checked. Dr. Ilse Levin specializes in internal medicine, but you could say she really focuses on incarceration medicine. Levin works at a community health center in Southeast Washington, D.C., that pays a lot of attention to treating people often left out of health care: newly released prisoners. "I have patients who've been locked up for 40 years," Levin says. "They have no idea how to get refills, how to go to a pharmacy. Often, they don't know how to take their own medications, especially things like insulin." When prisoners get out, they often don't have jobs and, therefore, don't have health coverage. The insurance piece could be changing soon, though. The eligibility requirements for Medicaid are expanding in 2014 as a part of the health overhaul law. Right now, Medicaid in most states is mainly targeted toward children, families and the disabled. After the Medicaid expansion goes into effect, single adults who meet income requirements will be eligible, even if they don't have kids. Some states and the District of Columbia have gotten a head start and rolled out the Medicaid expansion early. That means Levin can get reimbursed for the care she provides to patients like Keith Snowden, a D.C. resident who got out of prison last year. Snowden had been dealing with uncontrolled high blood pressure for years, even before he went to prison in 2009 for selling stolen cars and counterfeit IDs. At his first post-prison visit to Levin's clinic, his blood pressure was off the charts. "The hospital was right next door. They wouldn't let me walk next door," Snowden recalls. "I had to have the ambulance come pick me up. It was that bad." Snowden says he had been taking blood pressure drugs for years to no effect. Levin conducted a barrage of tests and eventually discovered the culprit: a tumor weighing on his adrenal gland. Snowden had it surgically removed recently; now his blood pressure is back on the charts. "It took the free doctor for me to go and figure out my problem," Snowden says. "I really owe my life to her for being so diligent and trying to figure this out." Calling Levin a "free doctor" isn't entirely accurate. Her clinic is a federally qualified community health center run by the charitable non-profit Unity Health Care. Doctors and other caregivers there treat patients regardless of their ability to pay, but the kind of life-saving care Levin provided to Snowden costs money. Levin says it's much easier to provide appropriate care now that Washington has moved forward with the health law's Medicaid expansion, allowing her patients to get health insurance. "Now, everyone gets Medicaid," she says. "And suddenly I can get them their medications, I can get them to see a specialist, I can get the studies done. And it is amazing. It's completely changed my practice." Not everyone getting out of prison will be eligible for Medicaid, however. The governors of at least half a dozen states say they won't participate in the Medicaid expansion because it's too expensive.